Today, Lizzy brought the boys to the Rat Show on Mercer Island, Washington from Little Mischief Rescue which is located in Canada . So, you ask - why are they coming all the way down to the Seattle area? Well, the story goes this way. I have had many a ratling in the last 6 years (or more). In all those years, the ones that have endeared themselves to me the most have been big, squishy boys. Except for my Cordelia, of course. Note: If I mention other pet names in this diary, you can see pics of them on my pets page on this web site. I will include the link at the bottom of this page. A little history about myself and ratties. I grew up in New York City. I used to see the rats in the alleys that were as big as my Lhasa Apso. But then, so were many of the cockroaches. Ok, a "slight" exaggeration. If anyone had asked me then about having a rat as a pet - well, I would have definitely said, "NO WAY!" Speed ahead many years and two girls later and we are now in a pet store all the way in Bothell, WA. My youngest daughter sees an aquarium full of young rats. She wants one. It is one that has followed her around as she moved her hand around the front of the cage. He is a hooded rat. We knew nothing about them. We didn't know that he was in a feeder tank and that he most likely would not be healthy. We also did not know that pine bedding was bad and that a fish tank was not a place for a rat. And that a rat should have a cage mate. All of these items we learned later at a price. While on line paying at the register, a couple behind us had also gotten a rat. Their discussion was rather loud saying that this was a fat one and that their snake will love him. Yuck. I turned to them and held my fingers to my lips and shushed them quietly then pointing to my daughter. They mouthed an apology and proceeded to whisper quietly. I do not think my daughter heard them as she was too focused on this rat. Anyway - Christopher, because he explored a lot, became a member of our family. And yes, he got ill. And we were so lucky that the vet we had been going to for many years was also a small pet specialist - especially rats. Out went the pine litter, in came a powdered coated wire cage, in came the proper food and fresh veggies as well as batril. Now Christopher was to be my daughter's rat. But she couldn't give him his meds which meant Mom had to do it. Eventually, he bonded to me. This upset my daughter and we decided that since he was so sick and needed a lot of attention that we would go get her another rat and Mom would take Christopher. In comes not one, but two girls. Also hooded and almost identical, Christina and Carly. Then I had emergency surgery. While I was in the hospital, Chris didn't get his meds and when I got out, he was sicker. I took care of him and in doing so, was able to keep my mind off what was happening to me. After I healed, he healed, of course, not totally. Then I had to go back in for follow-up surgery. Again, Chris didn't get all his meds. Again, I took care of him when I got home. He was really sick this last time. Then one day when I was much better I was sitting in bed with him on my chest as we tended to do. But he raised his head up high and gave me a look. A look that said to me that I was well now and his job was done and it was time for him to go. Tears welled in my eyes and I hugged him and kissed to top of his soft furry head. Then he lay his head back down on my chest and took one last long breath and was gone. I cried and cried and I still cry to this day when I think of that moment. I dug out the poem that everyone must know by now, "The Rainbow Bridge". Even though it made me cry all the more, I also knew that one day I would see him again. Today, if I had to leave for the bridge myself, I guarantee there will be thunder in the sky as all my pets that have gone before come running to great me. There is no way that there won't be. 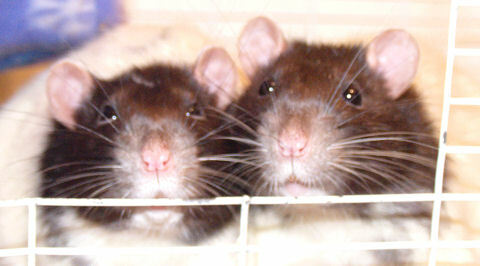 So, Christopher was the start and as you can see on our pets page, he was most certainly not last of our rat addition. And through all the years, I have come to love boy ratties best. Then there was Cordelia. 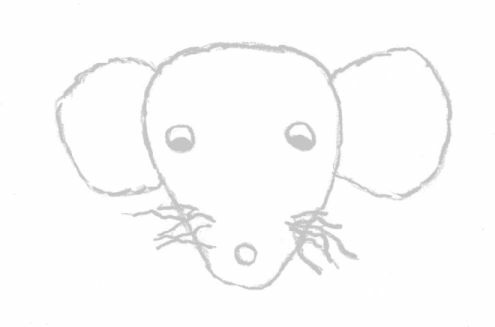 She was a lovely velveteen hooded variegated dumbo with a hairless gene in her. Her fur was soooo soft and her whiskers were so curly. And she was squishy like a boy and loved to lick everyone. She would sit quietly, yet also explore and get into trouble. I loved her dearly. Then I went to New Orleans to get involved with the pet rescue effort with my older daughter. I had this feeling that I wouldn't see Cordy again and took little movies of her and pics with my phone and camera. She had been getting tumors that even spaying didn't stop. I said my goodbyes still with this sinking feeling deep down. I was in New Orleans for 2 months. A week before I was to return, my younger daughter called me and told me that Cordy was really bad off and most likely suffering. From far away I had to make a tough decision. So my daughter and husband took her in later that day and then called me when she was gone. Funny thing is, she had appeared to me in a dream the night before as if to tell me goodbye and that she was going to be all right. I cried and with all the other animal rescuers there, I had a lot of shoulders to lean on. I have been looking for another rat that is like her. At the last show in Port Orchard, I found one little boy that looked a lot like her. I asked to get him and it turned out he was spoken for by another breeder. I even asked the woman if she really wanted him. She just couldn't let him go. I had felt such a connection with this little one, but it just wasn't meant to be. So I went ratless for a long while. I finally couldn't take it any more and the Best Little Rabbit, Rodent and Ferret House had sent out an urgent request as they had gotten well over 20 ratties left on their doorstep. I took my younger daughter with me and we went to see if there was one for us. One boy kept coming over to us and he ended up coming home with us. He licked my daughter all the way home, so we named him Romeo. But once he got home, he became a bad biter. My fingers were a war zone. So many Band-Aids. I felt like I should get stock in the band aid company for all the Band-Aids I was using. Almost took him back. But I did some research on the web and contacted some people about him. I worked with him at his pace and it took almost 2 months for him to not bite me and me to not fear the biting. He became a wonderful lovable pound and a half squishy rattie. What an awesome fella. I finally took him to Dr. Mitchell at the Juanita Veterinary Clinic in Kirkland, WA. and she said that he was not 1 year old like we were told, but closer to 2. My heart sank since that meant our time was much more limited than I thought. We enjoyed the next year with each other and then lost him due to a tumor on his spine at almost 3 years old. I decided I couldn't go that long without a boy again. I wanted to find a pair of babies this time so I could have more time with them. But no babies from the local breeders were to be had that I could find. Then I followed a link in a post to the Little Mischief Rescue in Canada. They had just announced a "sad" anniversary, the Monkey Boys had been with them for one full year. I don't normally read the sad messages on the newsgroups, but this one caught my eye. I knew the show was coming up on March 8th and sometimes the Canadian rescue organizations came down for them. So I asked if that would be the case this time so they could be brought to me and if indeed they were still available. After numerous emails and an application form they were slated to be included on the long journey to the show. When I first met them, they wanted to be held. I knew who Backup was right away since Simone at the rescue organization was so nice to send me photos to help identify them. He really liked to be held. But then the festivities began and the hoorays and screams and other jubilations started. At each round of noise, the boys got more nervous and skitterish. A gentleman was sitting next them was watching a little girl that has been coming to these show for many years as well. All of a sudden, her Mom and I had our attention diverted to a little girl holding up a bleeding finger. The gentleman said she had been poking her fingers into the cage. The mother wasn't too upset because she looked at it and it wasn't serious. But a child's tears always gets to anyone watching and they sure got to me since I have known her for so long. I felt bad, especially since I never have live rats at my table. I only sell things made for rats and their owners. Within 10 minutes, I was adjusting the cage and Wingman was sooo fast and then I had a bad bite on my finger and no Band-Aids. So I made one out of tissue and a tape after it stopped bleeding. I then sat next to them and talked with them. Wingman was sooo mad he was huffing and puffing at me. But the more I stayed there and talked to them, the quieter they got. Finally they all decided they had tired themselves out enough for a nap. I know we will have a long time together, but in the meantime, I need to go get more Band-Aids. Today the boys are much more quiet and ready to wander outside of the cage on the table. Wingman, the biter for now, didn't bite but did test the fingers a little. Each time he did, I squeaked. That seemed to confuse him and also made him stop. I have not tried to get them out of the cage, but waited until they have come out on their own before I picked them up. I haven't tried to pick up Wingman. I want to wait until he trusts me like I did with Romeo. It will take some time, but I would imagine not as long. Wingman has brothers to watch as they get picked up and pet and loved and that may help to convince him I am not there to harm him or take away anything of his. They love Pear and Bananas. I held out the banana for them and each one grabbed it and tried to run away with the whole thing. I held on tight and they did to leaving long deep gashes in the banana's soft flesh. It made me thankful that they were doing this with the banana and not my finger! Each one got away with a pea sized amount of banana and went to their own corner to chow down, each one's back to the other protecting their prize. I will be taking pics of them as time goes on. But for the next few days while they are adjusting I will try to refrain from doing so. I don't want to spook them with the flash. I will post the links here to their pics as I mention them. I also wanted to say Thank you for a great Rat show to RatsPacNW. You can learn about them at RatsPacNW's web site. Here are the first pics of the boys. They have been exploring more and more confidently outside of their cage. No biting has occurred - only "testing" nibbles and licking. They are getting their exercise by climbing up and down their big cage. Right now, after playing with them for a while now, each one is spread out sleeping away. Funny thing is, as soon as I approach their cage - they are wide awake. We are quickly learning what vegetables & fruits they like - so far they like broccoli, carrots, kiwi, banana and pears. They will get a lot here since my daughter and I are vegetarians. My poor husband doesn't seem to mind. He eats what we do and if he is really feeling meat deprived, he will cook some chicken himself. I am sure he gets his meat fill at lunch away from home. Hopefully Wingman has decided to be a vegetarian too. I wasn't going to make this a daily entry page just because of space issues - but I couldn't resist telling about today's adventures. I had the door open again and then I leaned on the table to get myself closer to them. I got groomed all over. They parted my hair for me, cleaned my fingertips, tried cleaning the tip of my nose but I decided to squeak just in case they were a little to eager in their cleaning activities. I got to hold and cuddle with Sidekick and Backup. Both came back for more and Wingman watched as they got their loving. He got more and more curious and I bet tomorrow he will want to closer attention as he sees what they are getting. And when they have been out for a while, they just get so excited that they end up walking over each other everywhere. At times, they almost seem to popcorn like they must have done when they were babies. I have learned quickly that when that time comes, it is time they head back into their house to settle down or someone may get hurt. I did notice a small red scab on Backup's back, but it was small and it looks like it is healing on its own. Sometimes they play rough and it is usually Wingman that gets picked on. Twice now I have caught Backup on top of Wingman as he lay pinned under him. And Wingman squeals when that happens. So, twice I have blown on them to get Backup to stop. The look from Wingman is almost like a Thank you and since I have done that, he seems to be more receptive of me. Something very cool happened today. I was playing with the boys who seem to be getting more and more responsive to me. 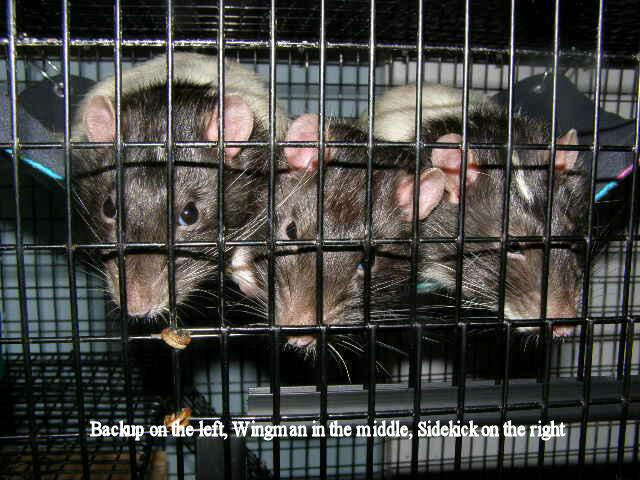 They were climbing their cage as usual and Sidekick and Backup can get down on their own but Wingman has a problem. I have been opening the upper cage door so he doesn't have long to travel down the side and into the cage through the upper door. But today, he didn't seem to want to go back into the cage, but yet he couldn't get down. He seemed to be getting himself into a tizzy. I took a chance and scooped him up quickly and cuddled him. He didn't fight and he didn't bite! After a while, he seemed to like being cradled. Yeah! What a leap. I didn't think it would take that long. I knew he was just scared. He seems to be the one brother this has the least courage and is the lowest rat on the totem pole. I took more pictures and will create a page for them soon with a link here. Monkey Boy Pics. They also love mangos and sweet potatoes. Ok, I know this little diary is supposed to be about the Monkey Boys. But I just had to say a little something here are a little girl I have named Blondie. She has been with us since last July. Wow, that is a long time. When she came, I was warned that she bit. But I did not expect the truth in that statement. She would allow you to pet her and then all of a sudden, she would take a couple of steps back, lower her head and then lunge for you and bite hard. If you started to remove your hand at the time of the lunge, then she would follow it in a full fun until she got you. The look on her face was almost one of sheer hatred. She was actually scary. Well, after Romeo, I felt that time would heal her if I kept trying. And trying at her pace taking my cues from her. It has been a very long road. But in the last month, I noticed a change. Of course I also realized that she was my first Ruby eyed rat. Once I realized that, I started to make a noise she could identify me with. I would start making it as I entered the room. She came to recognize it. I could see it in her eyes. And she started to watch me as I picked up and held her sister close by her. I know she wanted that kind of love and I am more than willing to give it. Well, this morning, both little faces were again looking out at me. I opened the door and Blondie made moves to climb out of the cage. Unfortunately, where they are, she cannot unless she climbs out onto me. After many attempts of her wanting out, I took a chance. I scooped her up from behind, gently and quickly with one hand and my other under her front feet. I cuddled her quickly in my arms and waited. She settled right in and seemed to really enjoy the back scritching. In a minute, she was bruxing! She let me pet her all over. What a morning! So long have I waited to be accepted by this little furry creature. We will continue to move at her pace, but this was a big step for her. I hope there will be many more. She is such a beautiful girl. So, I know she isn't a Monkey Boy, but I just had to share this moment. Today was the best day yet. I believe Wingman has adopted me. They are all still very cautious about coming out of the cage, but once they are out - they are all over the place. Wingman seems to want to snuggle more than the others when I get them in my arms. I believe he is just a very sensitive boy. He is always the first one to come to the door to say hello. His eyes no longer have that fear in them I saw at the show after all the loud (and fun) festivities started. With each noise he bolted for cover. Maybe I should have held him just so he knew he had a protector. But hind sight is 20/20 right? Sorry I haven't written anything. My younger daughter decided that the lesson of sharing meant sharing the stomach flu too so I have been down with that since Monday evening. It started slow during the day, but by the evening, I couldn't do much. I believe the worst is over now and I just have to get my strength back. I did have to change their cage today. It has been a challenge to change it. I have figured out that if I put a pocket manilla folder up on the top shelf covering the hole to the next level and then put the three up there quickly, I have just enough time to take the cage out of the base before these clever big boys figure out how to move it aside to scamper down and help me. They love to play with my hands as I am removing the old stuff. I have no fear of them biting anymore. I just have to stay aware of the posture of me offering food. Otherwise, playtime has been awesome. And then when I put in the new stuff, well - they decide where it all goes. I put a pile somewhere and they push it all around to where they want it. Yeah, I do help in the end to make sure there is enough in there, but they have done most of the work. I think they make me think they are helping when all they are really doing is staking their claim to the area that is theirs. But who cares - it is sooo much fun to watch them push with their hands or bury their head under a pile and run forward. Such little workers. So now their cage is clean yet again and they are proceeding to take their lab blocks and finding new places for them in the new litter. Fortunately, these blocks are the ones I had fed them after the cage clean making them think they are treats. They still have their bowl (which is securely attached to the cage) on the top floor. Oh, and all three at the same time decided I had a dirty, not rattie smell, face. So all three were preening me at the same time. Boy, are their tongues warm and fast. My eyebrows will never be the same. Who needs a beautician when you have ratties!